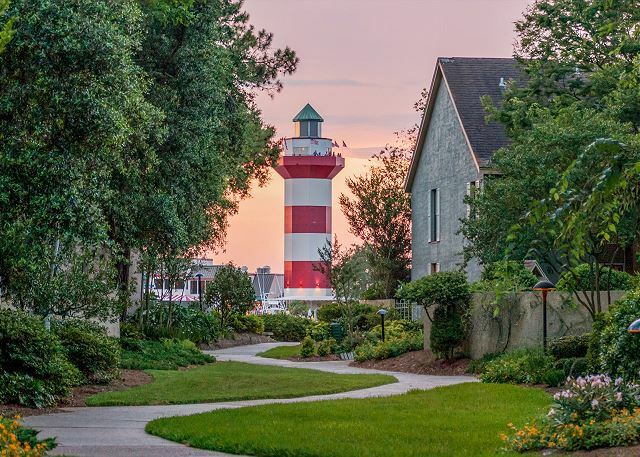 Schooner Court is in the heart of Harbour Town ... steps away from the famous Yacht Basin, the candy-striped lighthouse, a myriad of restaurants, shops, and vacation activities. 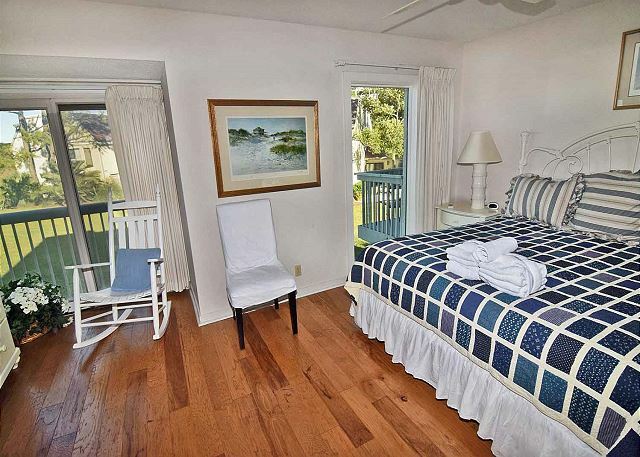 Guests staying in this property enjoy wonderful views of the Calibogue Sound from the living area and two of the four bedrooms. King in master bedroom, queen & double in bedroom 2, king in bedroom 3, queen & double in bedroom 4. 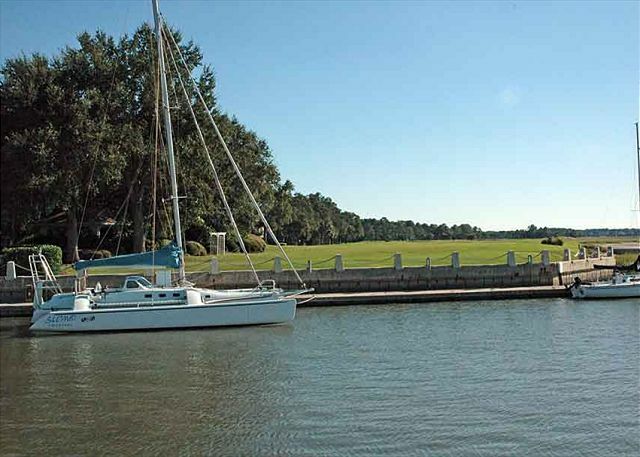 The Harbour Town Golf Links, Racquet Club, and Harbour Town Pool are a short walk from Schooner Court 726. 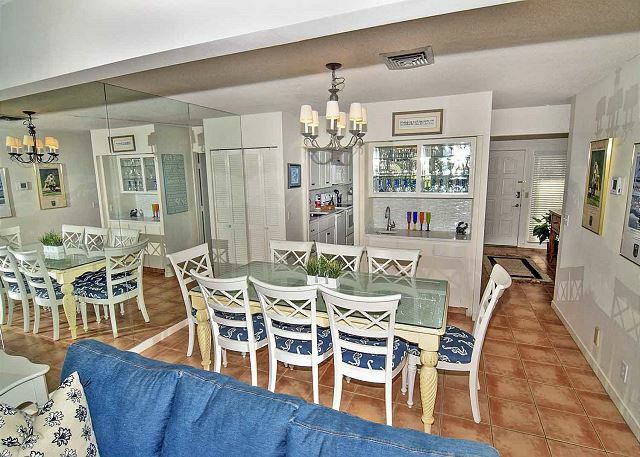 Picture breathtaking sunsets over the Intracoastal Waterway from the patio of this unique property. 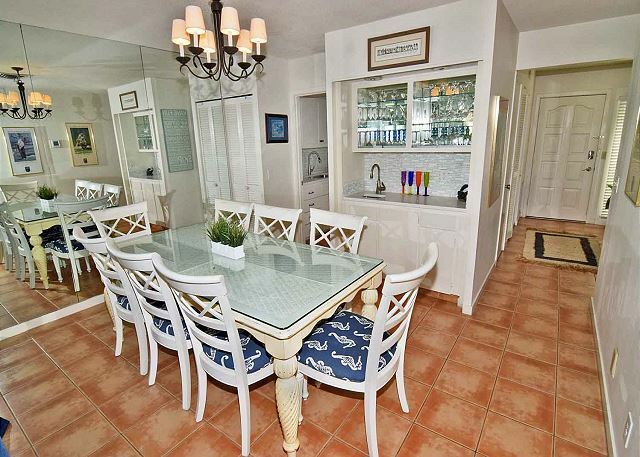 This property is well maintained, and the owner has made sure it will have everything you will need for the perfect vacation. Call Manager for Specials and Questions about this wonderful property! 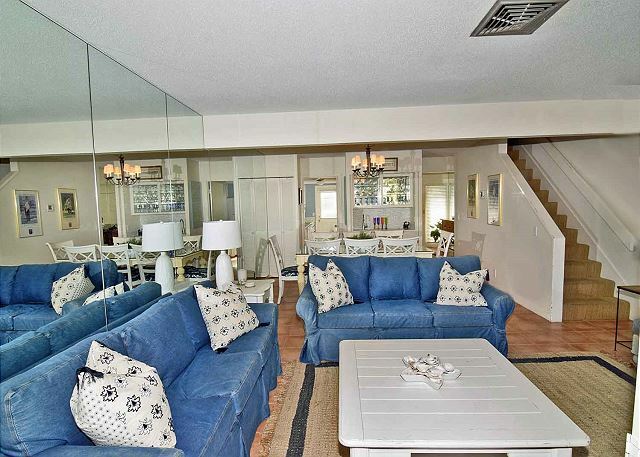 Our 4 bedroom 4 1/2 bath condo was perfect for our family of 11, which included 7 adults and 4 children ! 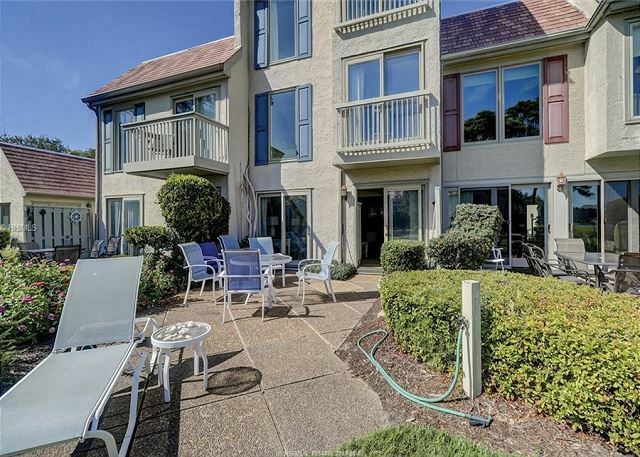 The location in Harbor Town, the view of Calibogue Sound, the patio, a 1 mile ride to the ocean and short bike ride to the pool we're perfect! Everything was neat, clean, decor was excellent and appliances & layout were great! We all agreed we would definitely rent this property again for a return visit! 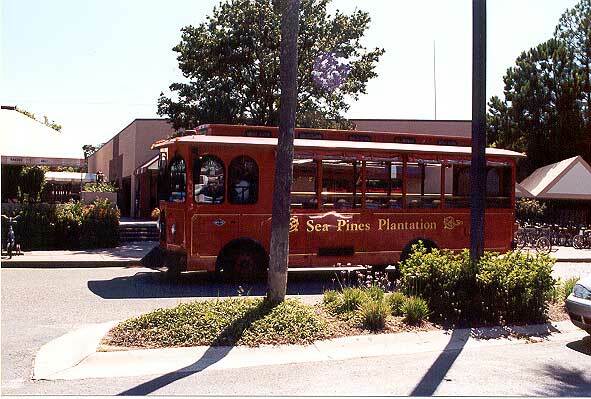 Only suggestion we had is perhaps for some booklets such as the Island Events magazine and the Sea Pines guest info upon arrival , we've come to Hilton Head several times but always like to check activities, coupons etc! Property was very quiet and clean. We spent most of our time on the back patio watching sailboats, dolphins, other boats pass by. Restaurants, shops, entertainment just across the street. 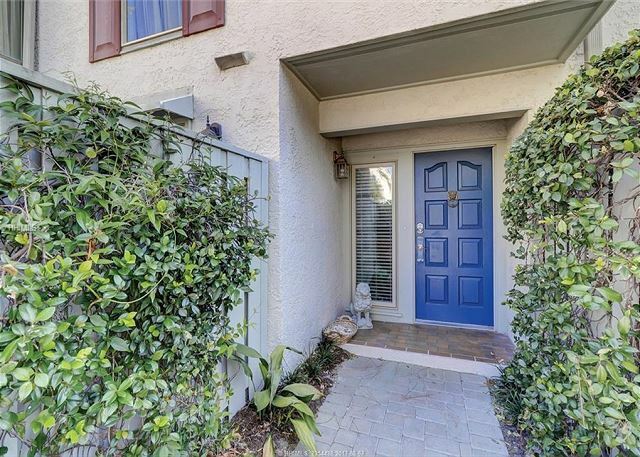 This rental is located within walking distances to just about everything you need. 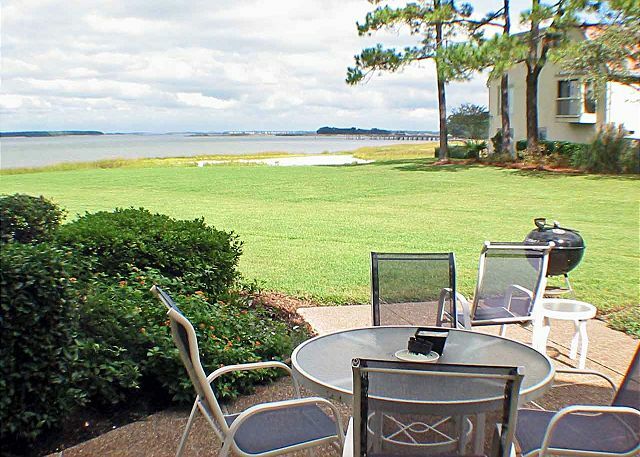 The views of the water were fantastic and the property was immaculate. A upgrade on the television would be nice. Not many HD channels. With that said, I would highly recommend this property. Three Years at Same Condo - Speaks volumes! Love this location! 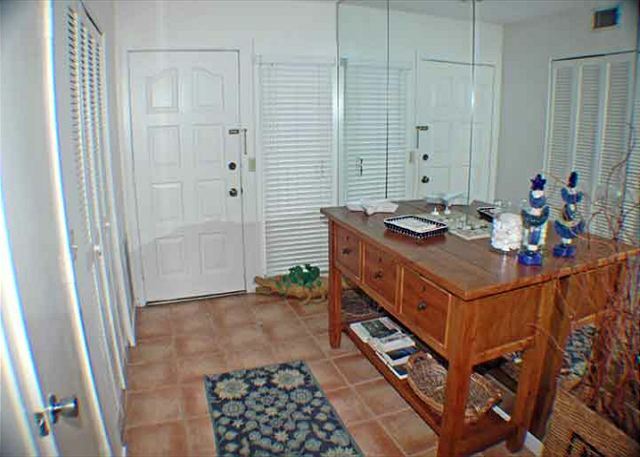 Condo is very spacious and has a magnificent view from back patio. Living room furniture could use update. Our stay at 726 Schooner Ct was wonderful. The location was perfect and amenities were great. Problems we had after check-in were quickly addressed and fixed. We truly had a wonderful vacation ! We had a great time. The Condo was and clean. Very comfortable. Our vacation experience was wonderful. 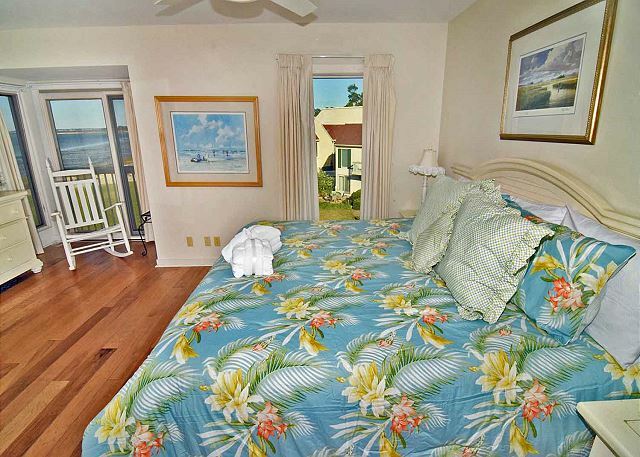 The villa is in a great location and perfect for several couples or a guys/girls weekend. The only thing that would make it even more convenient would be if the villa had an automatic lock with a key code. It makes it easier to check in and out and you wouldn't have to worry about losing keys while your on vacation. 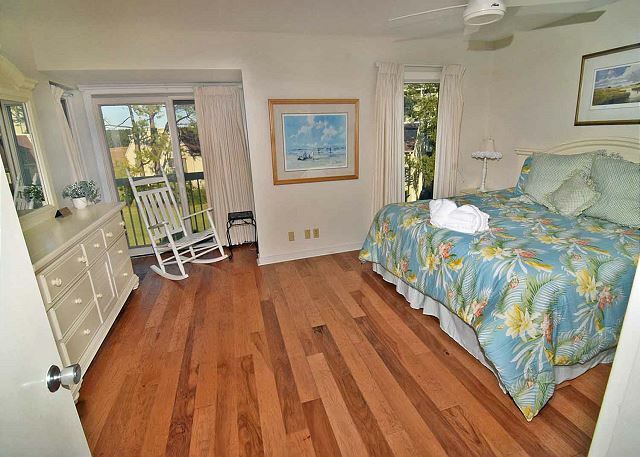 Perfect location for HHI stay. We had an Easter gathering at Schooner Court! Each family had a bedroom and the extra beds in 2 of the rooms were perfect! The kids loved playing in the backyard which overlooks the water. 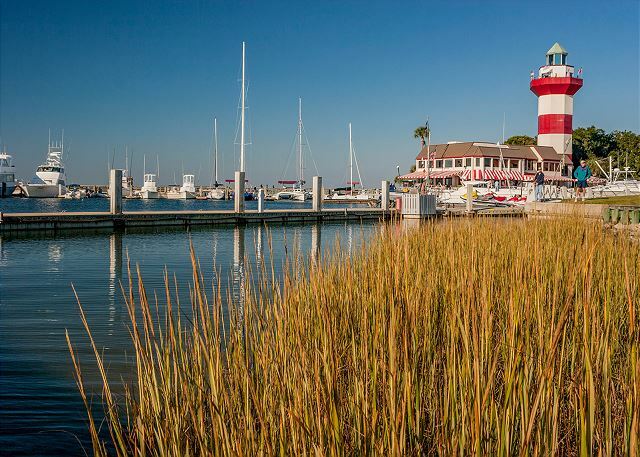 We have vacationed in HHI for 40 years and this location is one of our favorites! We will definitely be back. Wonderful stay in Harbor Town. The Property was just as described, but it was even better than i realized. The walk out onto the patio and the view of the water is spectacular. 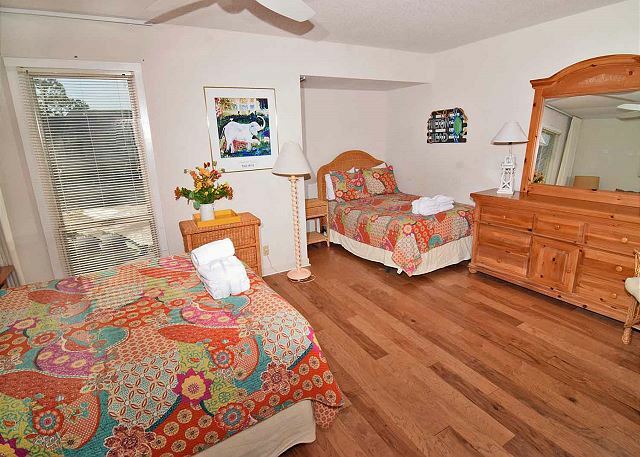 The rooms are spacious with lots of natural light. It was a treat to enjoy this home. This was our second vacation in this condo. 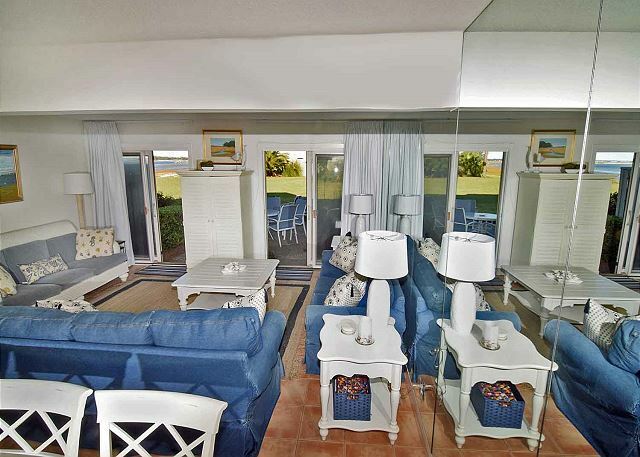 The condo is very spacious - large rooms - and there is a beautiful view from back patio. The location is perfect for our family. There is a short drive to the Beach Club and parking is limited there during the middle of the day. Recommend getting there by 9 am or taking the trolley. 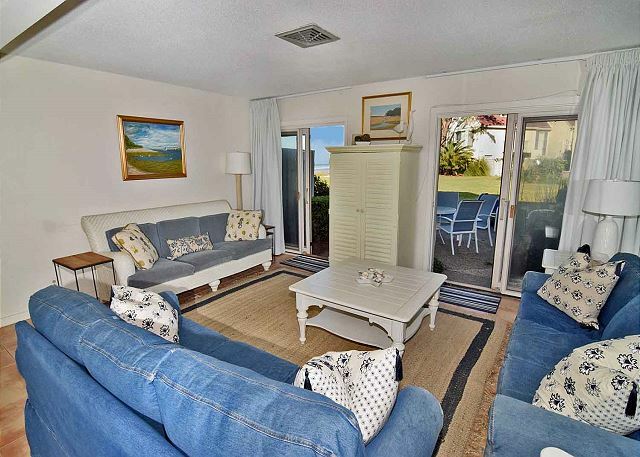 Undoubtedly, one of the best condo locations on Hilton Head. 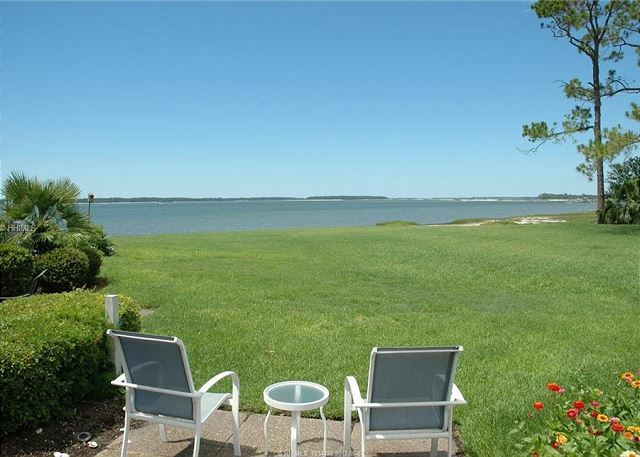 Walk out the patio door and enjoy the sights, the sounds and cool breeze of Calibogue Sound. 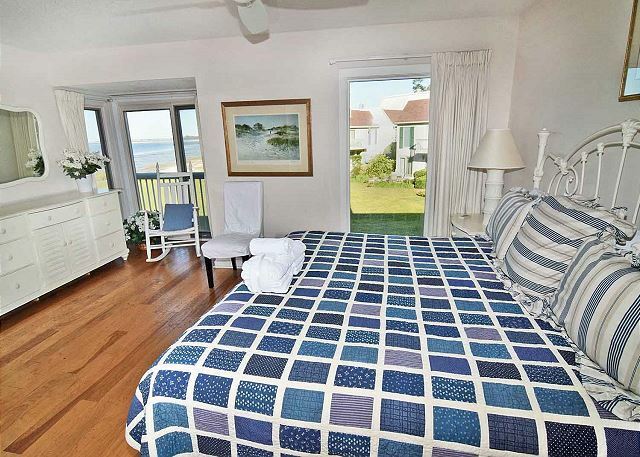 Watch for dolphins, walk to the harbor, the shops, or the pool. Bike to the beach. We did it all with 6 adults and 5 young kids. 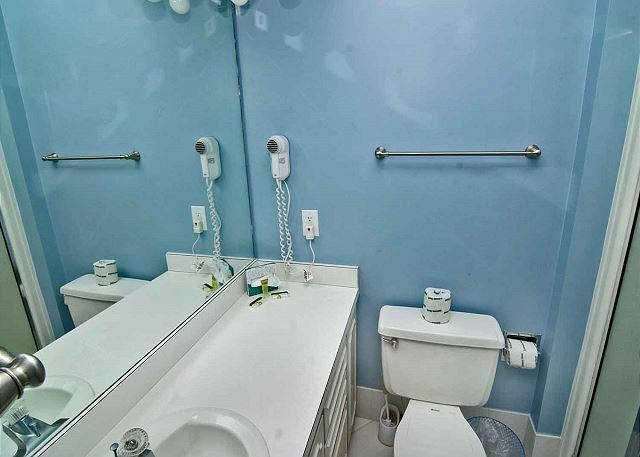 A bathroom in each bedroom was ideal, especially after returning from the beach. 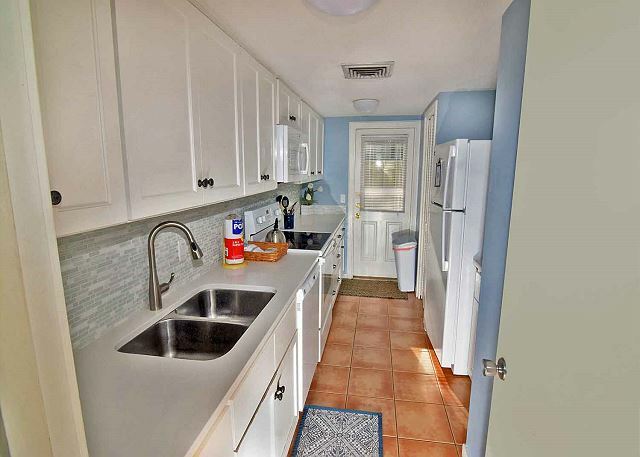 Clean, new washer and dryer, comfy living room, spacious bedrooms and reasonably priced. This condo made a good vacation great. Looking forward to a return trip next June. crowded then but there are more activities in the months of June through August. But there was plenty for us to do. It was too cold to swim but the kids enjoyed wading in the Ocean at the beach. This was our first time staying at a Condo by a Sound and we all agreed we liked it just as much as staying on the Ocean. We got to see allot of shore birds and watched the sail boats. Our 18 month old enjoyed watching the boats too. When we came home he kept saying boat. We hope to come back and see you again. Loved Hilton Head Island. Great villa and perfect location for the Heritage golf tournament! I would however, recommend that they convert to a combination lock instead of a keyed entry. We enjoyed staying here - accommodations were comfortable. Only complaint was lack of staples in kitchen - no slat, a tiny bit of pepper, no hand soap - very little dishwashing soap, no coffee - ice not ready in frig. Usually all of these items and more are provided. Grill on patio - instructions said not to use? No charcoal available anyway. Convenient location. Fun to watch the dolphins in the evening. This was our first trip to HHI, and we had no idea which area would be right for us. We had 4 couples/families, and knew we needed at least 4 bedrooms. We're so glad we picked this town home. It was perfect for us. 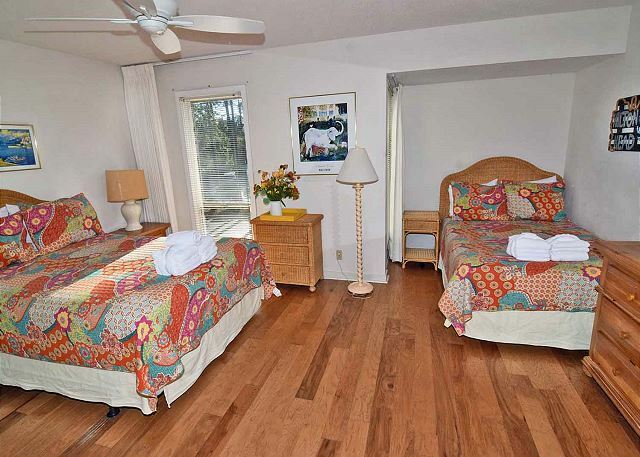 It has 2 large king rooms and 2 rooms with 2 full size beds. 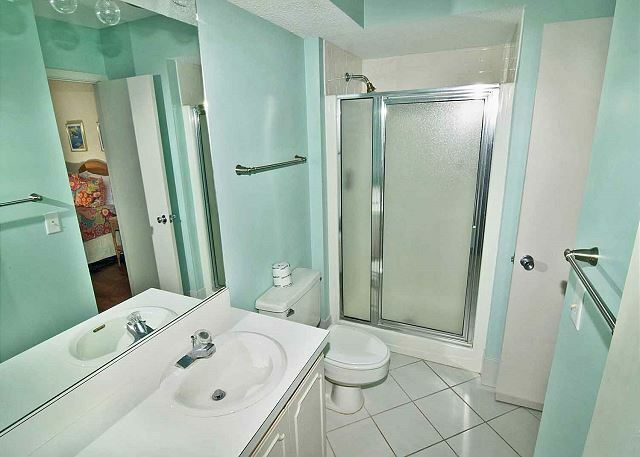 Each bedroom has it's own bath, plus a powder room downstairs. The trolley stop is right across the road, so you don't need to drive at all, unless you need to go to the grocery store. 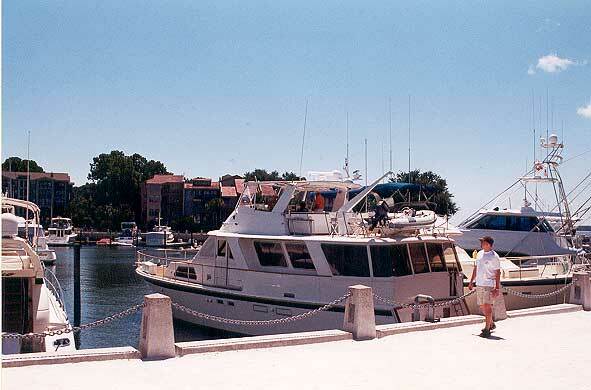 The town home is right next to the dock, where you catch the cruises. We took the pirate cruise and the cruise to Savanna, which were both great! 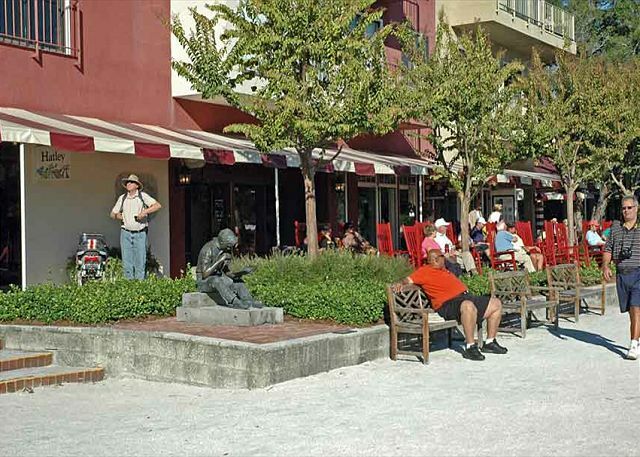 It's also right across from the playground and the huge live oak tree where the children's concerts are held nightly, which, by the way, are just as much fun and entertaining for the adults. We were there for the Fourth of July, and literally walked out the back door to watch the fireworks show. One thing that would have been nice to have, would have been a larger outdoor grill. The one there is way too small for a unit made for so many people. 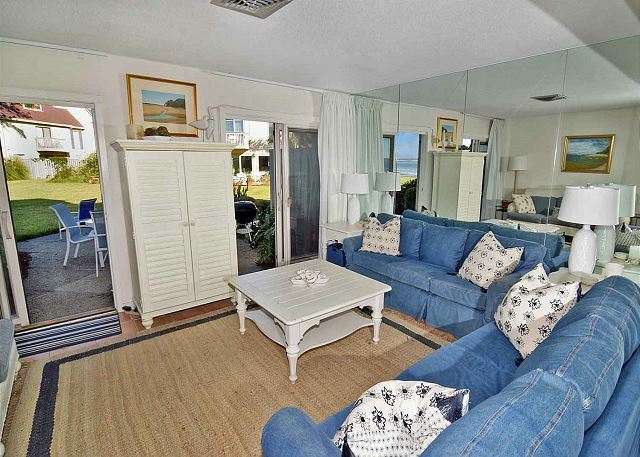 We had a wonderful stay, and would definitely stay in this rental again, or in another Schooner Court unit. The location couldn't have been any better for us. Usually rent abother unit in this complex but it is no longer available. This unit was nicer inside and a better layout. If the airlines didn't mess our luggage up we would have liked it even better. We will be back next year. There were a few issues with the condo. The upstairs bathroom light did not work. We had to bring in a lamp from the bedroom to use the bathroom. The handle on the screen door kept falling off and we had to keep fixing it. Also, the door to the trash area would not stay closed if it wasn't locked. The location was great and we had a wonderful time. Thank you for your comments. 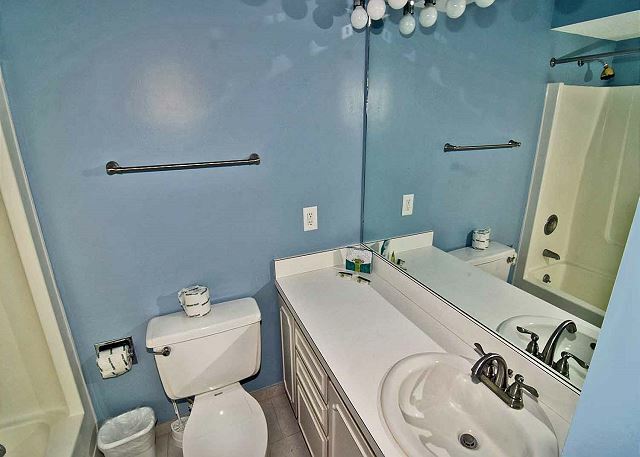 We appreciate you letting us know about the light in the bathroom, and have sent an electrician over to fix it. We have also repaired the screen door and reported the service yard area to the homeowners association. We are so glad you had a good time and hope to see you again! This was a "girl's trip" to celebrate a special birthday and we all had a wonderful time! I will definitely plan to stay in this property again. 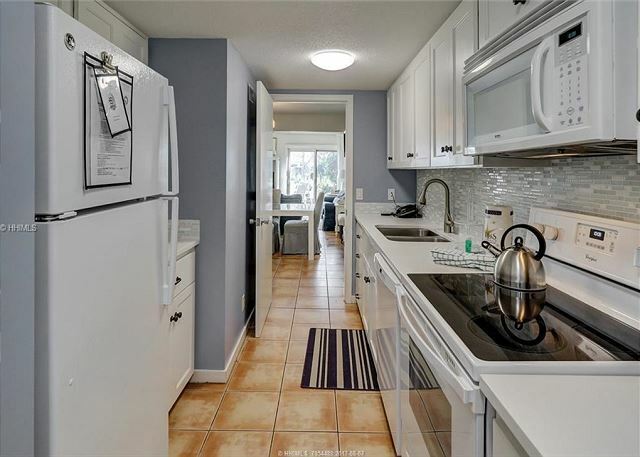 Perfect location, wonderful views, very clean and condo floor plan was great for couples! Would definitely recommend it to anyone and would stay there again! We enjoyed our Christmas vacation in Harbor Town. Check in was a breeze and the management company or owner promptly answered any questions we had. Initially, I searched everywhere for the code for the wifi and finally emailed the owner for that. Later I found it on the note on the side of the fridge. Might be good to put that info on the info sheet in the packet or have that refrig sheet on the FRONT of the fridge. 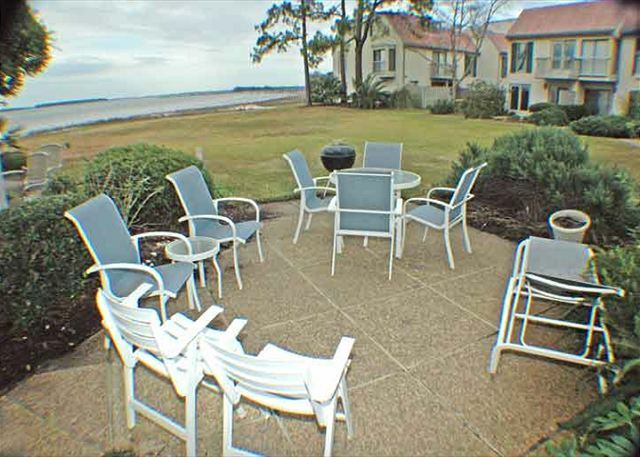 The location is great and we enjoyed watching the pelicans and dolphins in the sound right from our villa. Weather could have been better but it was way better than all the snow they got up north. Kitchen utensils were a bit sparse...had to peel my granny smith apples for a casserole with a steak knife since there was no paring knife. I would recommend this property to anyone without pets. We would stay here again but next time would like to find a rental where we can bring our 2 small dogs. Thank you. 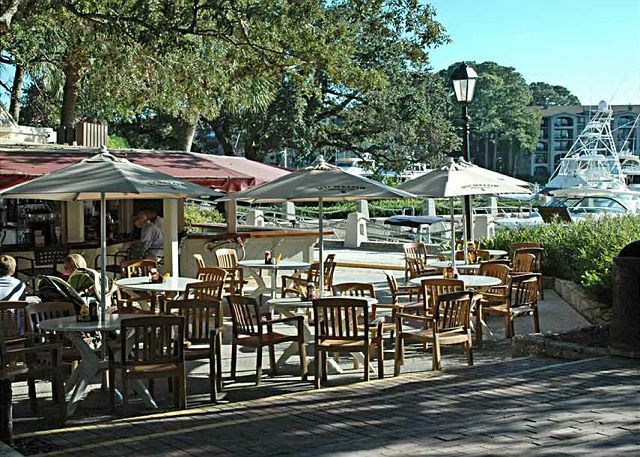 Great location for Harbortown lovers! 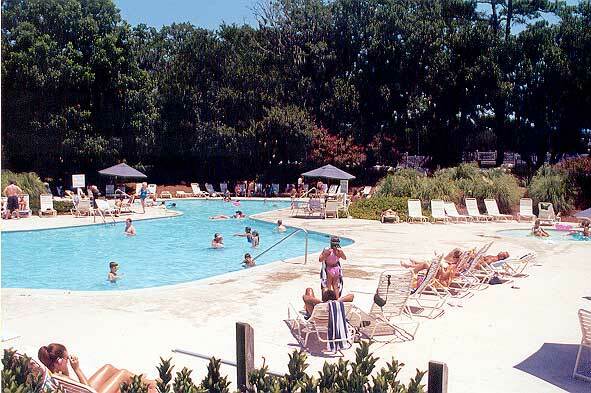 Schooner Court was a great place to stay with teenagers! The proximity to shops and restaurants was perfect, and the biking was great. The kids loved the sound out back, and played in the expansive yard. The townhouse slept all nine of us comfortably, however the cooking /dining was a challenge. Both areas are small and we were unable to sit together for a meal .The dining area comfortably seats only six or so. Also was (unrelated to rental) disappointed in beach access in Sea Pines. The beaches werea good drive away and PACKED with wall to wall people..hard to find a parking spot, impossible to play games on beach. 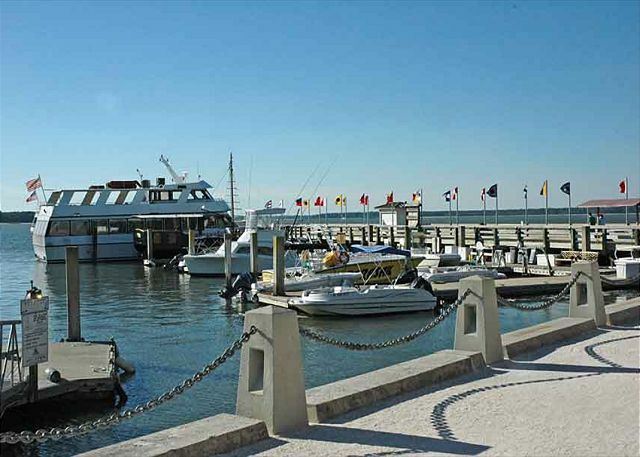 Again, fantastic location for Harbortown lovers. Great location. Fantastic property. It just needs some updating on he decor in some of the rooms. 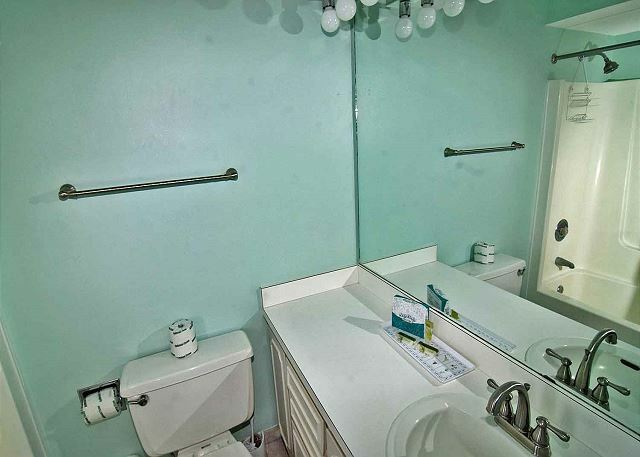 for example the bathroom in the top floor is in need of some attention. Just a minor point. Would come back in an instant !!! Cheers for a great vacation. The location of the property was perfect for our use which was the Heritage golf tourney. Beds were great. We had 4 people and all were satisfied. 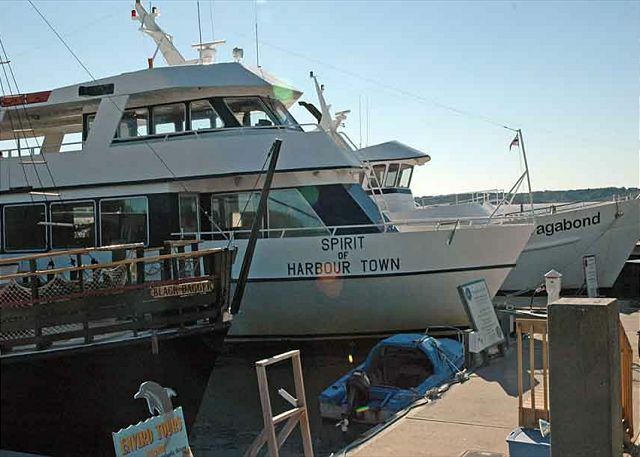 The only thing that needs improving is the outside seating. We had a great stay even though it was cut short by a hurricane. 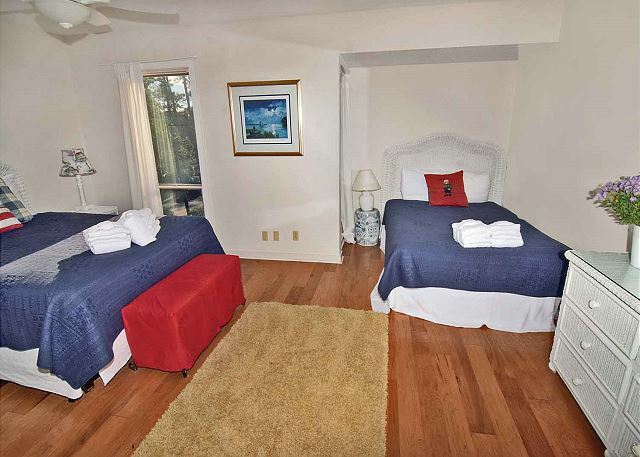 One thing I would recommend is more properties with twin beds for the people who are bringing groups of friends not couples.